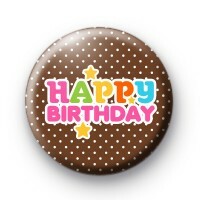 This is a listing for a 1 inch birthday button badge. You know that NO birthday is complete without pin badge. Its the easiest way of letting people know its your special day, a day of celebration. This polka dot badge has the words Happy Birthday in brightly coloured font and a yellow star too. Make sure you take a look at our other birthday badges as we have quite a cool selection. Oh and Happy Birthday.